Wilson Dudley Coleman, Lieutenant Colonel, United States Army, born at Fort Logan H. Roots, Arkansas, 7 March 1911 and who died at St. Denis, 30 July 1944. 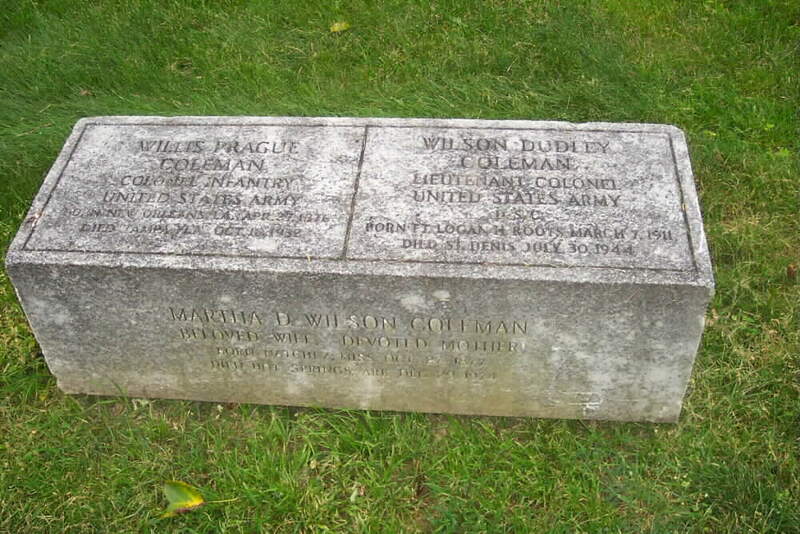 Buried with Colonel Coleman are, his father Willis Prague Coleman, Colonel, United States Army, and his mother, Martha D. Wilson Coleman, born at Natchez, Mississippi, in 1877 and who died in Arkansas in 1924. Coleman Barracks, formerly Fliegerhorst (flyer's nest) Kaserne, was built during 1938 as an airfield for both fighters and bombers. At the beginning of the war, the (Luftwaffe) fighter squadron "Pike-As," commanded by Hans Moelder, was stationed here. Moelder was one of Germany's top air aces, having shot down over 300 planes, mostly Russian. The naming of Coleman Barracks is exceptional in that it is the only Barracks in the Heidelberg area other than Patton to be named after an officer. Its name commemorates Lieutenant Colonel Wilson D. Coleman, who was posthumously awarded the Distinguished Service Cross for single-handedly halting an enemy column. NEW YORK, February 20, 1945 - Mrs. Alice Moeller Coleman, widow of Lieutenant Colonel Wilson Dudley Coleman, of New York and Fort Knox, Kentucky, who was killed in action in France on July 30, 1944, has been notified by the Army of the posthumous award to her husband of the Distinguished Service Cross and the Bronze Star. The former citation said that Colonel Coleman, a graduate of West Point, 1935, displayed "extraordinary heroism" when, shortly after midnight on July 30, he came upon an enemy column approaching. "Quickly selecting a protective spot he single-handedly fired four anti-tank rockets at the leading tanks, and scored three direct hits, thereby destroying the tanks" the citation added. He was killed later but his action, it was said, not only saved the lives of many of his men but "contrbuted substantially to the success of the break-through operation into the heart of France.